You have not lived until you have tasted Medovnik cake. The most popular cake in Prague, it is well known in countres like Russia, the Ukraine and Croatia, but is virtually unknown in North America. It’s not dry, but it’s not really moist either. Some have said it’s like eating golden sunshine. Medovnik is a 10 layer honey cake flavored with cinnamon that has a sweet, unique taste to it, quite unlike anything you will have eaten before. It is not that hard to make, and is a fantastic, unique dessert to make for a special occasion that will have your guests raving about it for days. The cake recipe below is from Pauline’s handwritten recipe in the cookbook, and the cream filling is from a cookbook that was in her collection from 1914 in Dolny Kubin, Slovakia. I have also seen the cake called Honey Cake, and Marzipan Cake. I have modified the recipe slightly for use in today’s kitchen, but I do love the poetry of the original, and have included some of it in the recipe below. Next to very gently flickering coals, bake for 1 hour. This cake doesn’t keep very well beyond a day, so make sure it is eaten up. There is one company that makes Medovnik cake for many of the bakeries and supermarkets in Prague, called Medovnik Cake Factory. They make over 20,000 cakes a MONTH! There is a closely related cake called Marlenka, but the filling and topping are different, and it is cut into squares. You can hear about the Medovnik honey cake craze on Radio Prague, here. One of my favorite foodie bloggers, Monika, who is based in Croatia has written the Croatian version of the recipe, called Honey Pie, and here it is translated to English. I hope you enjoy this fantastic cake as much as my family does. Hi and thanks a lot for sharing the recipe. I was wondering what measurement you mean by “l” since you use it for flour. Do you mean liters? Thanks again. I’ll soon try it. Alright, will try it. cheers. Hi, just wondering if anything had been decided about the “Liters” measurement, since I’d like to make this cake sometime soon. 🙂 Had it in St. Petersburg and fell in love. Hi there. I’s sorry, I had looked it up and tested it, and forgot to update the post. You can use 4 cups in place of 1L. I’m off to Prague in a few weeks, and can hardly wait to try it there! Thanks so much. I’ll give that a try! My family is Slovak in origin, too, and my grandmother’s parents and grandparents came over from the Prague area and settled in the Midwest in the late 1800s. I have so much enjoyed reading your stories and recipes, which are similar to many my grandmother has shared. I am so glad you are enjoying reading this. I hope you will tell me how the cake turns out for you, and will one day share your stories too. Don’t forget to make sure you let the cake with filling sit in the fridge for several hours to let it all soak together. Hi there. I checked the packets, and they say 9 grams. Hope this helps! hii!! thanks that does help! one more question .. um decagrams? in ounces or grams..
… is 30 dg of butter is = to 300g ? is that right? and any tips about how this cake is made! im thinking of making it …! the filling sounds confusing! I updated the recipe so that everything is in imperial measurements. I hope this helps. I also adjusted the amount of sugar in the cream filling, as less than 1/4 cup didn’t seem right. The EU delegation in Washington is putting together a giveaway cookbook representing recipes from some of the various nationalities of staff here. 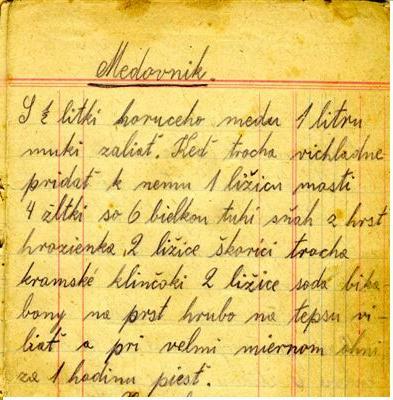 One Czech member suggested your recipe for Medovnik cake–she brought back a sample after her Christmas holidays in Prague. We wondered whether we could include your recipe (with reference to your website, of course). The book will not be sold. We will be happy to send you a hard copy–we expect to have it in hand in early May. At your convenience, you can send me your mailing address. Thanks so very much Tonya. Oh thank you so much… slovak ladies here in Australia still make it and it’s the absolute best. To add a little to the favour you can put a layer of home made apricot jam before you put the cream on! Yum Yum YUM! I am loving your website and reading all the recipes. Being from a family where my father’s parents came from Russia and my mother’s from Romania, this type of food is right up my alley! Made the Medovnik for special company, last night. Wow, what a great cake, THANK YOU so much! 1. I was working pretty fast but plan on taking a full-hour to an hour-and-a-half to make the batter, bake/prep the cake layers and apply the creme frosting. 2. I used the raisins, called for in the recipe, which gave it a good texture and taste. 3. Do you wait for the honey and flour mix to cool first, or can it be done warm before mixing it with the whipped butter? I blended the mixture warm, which was almost a pure butter reduction so I took a guess and chilled it, for about 10-15 minutes in the refrigerator, before applying the cream filling. 4. I put a tsp of rum and Grand Marnier into the batter and chocolate drizzle. 5. I put a thin layer of walnuts and chocolate drizzle between each of the cake layers and top. What a FANTASTIC treat, everyone had! Hi Mike, I am so glad to hear it all worked out! I forgot to mention it did take a while to make the cake layers. Did you make the creme yourself or use sweetened condensed milk? And did it soak in the fridge for several hours? I didn’t realize how long it was going to take to make and prep the cake batter until I was well into it so I had a few less hours to chill it in the ‘frig. YES, I used your condensed milk “solution” for the creme filling which was very easy AND criminally delicious. Is the creme filling suppose to be “stiff,” medium, thin, or runny? What kind of consistency should it be? Are the cake layers suppose to be light and fluffy or more firm-like? Once I blended the warm honey/flour/raisin mixture into the whipped butter, it thinned out considerably (almost a liquid state) so I put the filling back into the fridge, for about 20-30 minute, before I applied it to the cake layers. One way to help keep the cake a little more moist, MIGHT BE to either add some vanilla pudding, and/or vegetable oil, into mix? I’ve learned that baking is like calculus. What do you think? The creme filling is not as thick as icing; it’s runnier, and it should mostly seep into the cake. The cake should be dry as it’s not a high rising, fluffy cake. It has a very different consistency with the creme soaked in, and yet it has a slightly dry cakiness to it. It is really unique, and kind of hard to make right, actually. We just had what I think is this cake in Prague at a wedding. I’m not so sure I want to tackle trying making it, but would love to order one. Any ideas on where I can get one sent from a bakery? We each had several pieces and thought it was out of this world! Thanks! Can you tell me what foes on top of it? I struggled with it too. I will keep working on it. I tried this cake at an outdoor market in Perth, Australia, and have been wanting to try to make it ever since! thanks so much for this recipe Tonya! By the way, I love your translation of the passage from your grandmother’s recipe book….you are right, it is beautiful. I think my daughter and I will try to make this in the coming week. Thank you do much! I’ve been having problems with this cake recipe like others have mentioned, so I will have to go back to Slovakia and find someone who will teach me how to do it properly.